Having grown up in Dallas, I rarely thought of the city as a getaway destination, even though I’ve lived my adult life just 40 miles to the west in Fort Worth. Recently, however, Big D has grown into a place I hardly recognize, with its most exciting metamorphosis happening downtown. Today, the city center holds new discoveries I’m itching to explore whenever I find a spare moment. Not long ago, I decided to spend a weekend immersing myself in new adventures unfolding across downtown Dallas and the adjacent Arts District. The escape was ideal for my party of two, but most of the indulgences lend themselves to families, as well. 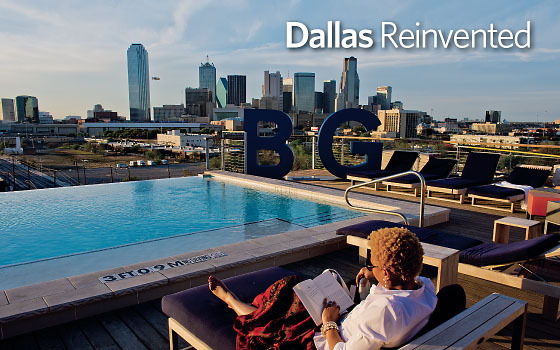 Here’s the lowdown on Dallas as a new urban retreat. Unequivocally, the December 2012 debut of the Perot Museum of Nature and Science—made possible in part by a $50 million donation by Dallas’ Ross Perot family—stands as a landmark moment on the city’s timeline. 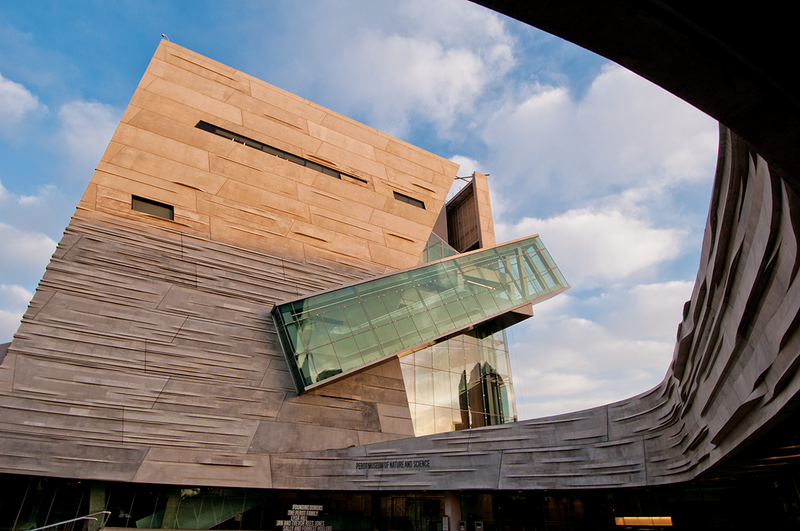 With five floors of public spaces filled with 11 exhibit halls, the Perot deserves mention with the nation’s best science museums. Among thrills in the Being Human Hall, for instance, we used our brain waves to launch a pingpong ball. In the Expanding Universe Hall, we toured the solar system in an animated journey. In the T. Boone Pickens Life Then and Now Hall, we gaped at skeletons of dinosaurs that once lived near where we stood. A 3-D film in the Hogland Foundation Theater, Sea Monsters, creeped us out in a delightful way with exquisite imagery of ocean creatures of the dinosaur age. Unequivocally, the December 2012 debut of the Perot Museum of Nature and Science stands as a landmark monument on the city’s timeline. Filled with natural light pouring through a multitude of windows, the museum building mesmerizes with its design, accomplished by 2005 Pritzker Architecture Prize Laureate Thom Mayne and his firm Morphosis Architects. Fashioned as a giant cube floating over a landscaped base, the building features a 54-foot-long escalator encased by a 150-foot-long glass rectangle on the museum’s south face. Riding up the escalator, we gained a fine view of the museum’s rooftop landscaping, an acre’s worth of rolling terrain comprising rock and drought-resistant grasses that characterize the natural Texas countryside. On the large plaza by the main entrance, we sat in the sun watching kids (and grownups) playing on frog sculptures emerging from the ground. Wandering across the street and east a couple of blocks, we found ourselves in downtown Dallas’ most innovative urban green space. The 5.2-acre Klyde Warren Park sits atop the Woodall Rodgers Freeway, which separates downtown and the Arts District from the adjacent Uptown neighborhood. Now the center of connectivity between the Perot Museum and the Dallas Museum of Art (which recently reintroduced free admission), the park turned out to be the ideal place for us to relax in the fresh air before continuing our cultural tour. 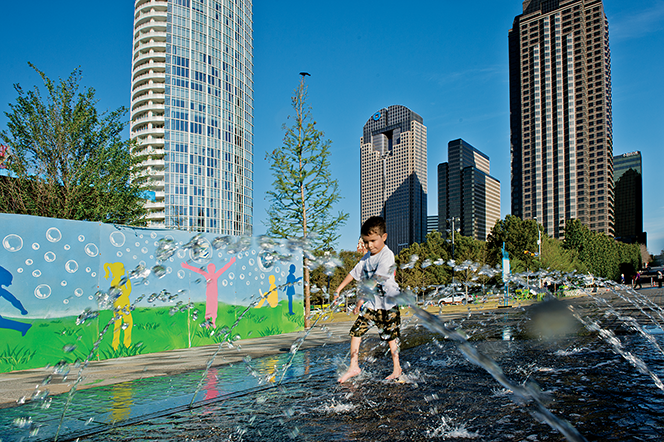 The splash pad at Dallas’ new Klyde Warren Park is a big draw for children. Walking the perimeter of the park—about a half-mile stroll—we watched families frolicking with kids, urbanites playing with their leashed dogs (bulldogs clearly being the favorite breed these days), and young couples canoodling on the lawn. Children and grandparents played chess on tables positioned on the park’s north side, next to a reading area that includes periodicals on wooden racks. On this Saturday, a yoga class took place at the park’s west end in a space also dedicated to Pilates and boot-camp exercise sessions. Park programming is free and includes a calendar full of activities like knitting, mahjong, and poetry, as well as concerts and plays. Food trucks around the park offer anything from Vietnamese fare to barbecue sandwiches to cupcakes. Late this summer, a new restaurant called Savor is scheduled to open with sit-down and take-out dining. Luck was with us as our visit coincided with The Dallas Flea, the boho-chic flea market that happens quarterly in the redeveloping South Lamar district, immediately south of downtown. Founded and curated by local fashion scribe Brittany Cobb, the Flea brings together some 75 Texas vendors of art, furniture, home decor, jewelry, and clothing in the former Sears building now called South Side on Lamar. We spent a few hours browsing through tables laden with items like stationery, artsy dog collars, vintage chairs, and handmade earrings. Eventually, we gave in to our hunger and set our sights on supper. Fascinated with the idea of crafting our own cocktails before dinner, we made tracks to the new Cook Hall, a gastropub that opened last fall at the W Dallas Victory Hotel. This warm and inviting spot within the über-modern hotel brings affordable, casual dining that’s perfect before or after a game or concert across the street at the American Airlines Center. The fun gimmick here is a do-it-yourself drinks kit, presented in a basket with a decanter of your preferred liquor. We had vodka, plus juice and soda mixers, herbs, citrus wedges, and extracts, as well as guidance from recipe notes left in a handy journal by other patrons. To eat with those libations, we tucked into appetizers of sumptuous pork belly sliders on crusty buns, along with a plate of deviled eggs and oysters on the half-shell. Dallasites have been flocking to Stampede 66 since it opened last fall. 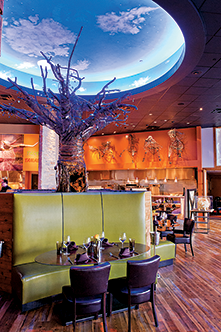 Another night, we joined the throng at chef Stephan Pyles’ newest restaurant, Stampede 66, just a couple of blocks east of the Perot Museum. Stampede 66 represents Pyles’ homage to Lone Star cuisine and his humble roots—the West Texas town of Big Spring and his parents’ truck stop. We adored the honey-fried chicken and buttermilk biscuits, as well as the smoked pork chop with green-chile hominy. A bite into the butterscotch pudding, we were reverently quiet for a moment—until we realized we were ignoring our slice of equally divine coconut layer cake. For Sunday brunch, we found lots to love at Café des Artistes, newly opened in One Arts Plaza, a few steps from the AT&T Performing Arts Center, a 10-acre complex within the Arts District that is home to the Winspear Opera House and the Wyly Theatre. A classic bistro, with marble-top tables, brass chandeliers, velvet draperies, and cushy red mohair banquettes, the setting proved ideal for enjoying short-rib hash topped with poached eggs and a plate of salmon Benedict, followed by beignets with raspberry sauce for dessert. 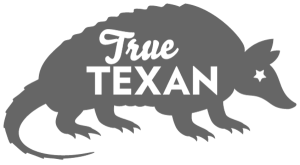 For our visit, we booked a room at the city’s newest stylish lodging, NYLO Dallas South Side, within a renovated five-story, century-old office building near The Dallas Flea, opposite Interstate 30 from downtown. One foot inside, we realized the NYLO wasn’t just another hotel: A grand piano covered in graffiti faced the front desk, and at the other end of the lobby, a pool table and ample seating for the bar crowd brought together a fashionable group for socializing. Upstairs, our room—with its exposed brick walls, cement floors, and industrial vibe softened by colorful throw pillows, blankets, and a plush bed—provided a good night’s sleep. But before we were ready to drift off, we headed to the rooftop swimming pool deck. Up there, we snagged cocktails at the poolside bar. Under a canopy of stars, we made a toast to the most magnificent view of downtown Dallas, our new favorite getaway destination.